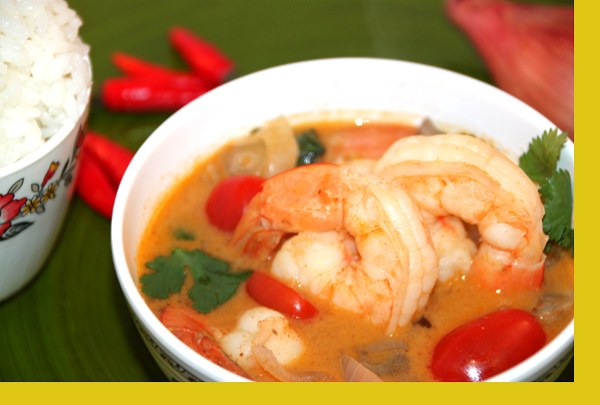 Chef Maria discovered this soup while traveling through Thailand. 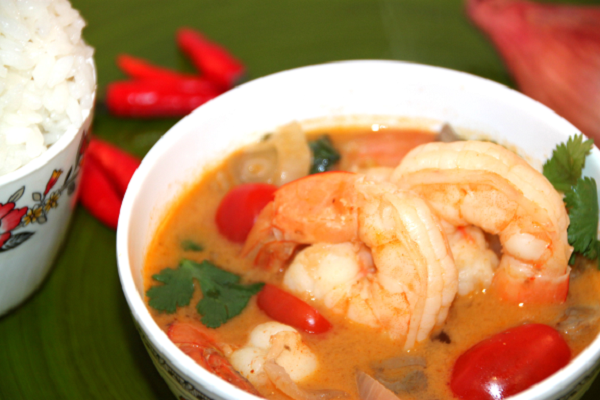 It's probably the most famous Thai soup pulling incredible flavors from lime leaves, lemon grass, ginger, coconut and chili's to make a spicy, sour and fragrant soup that's uniquely delicious when combined with vegetables and shrimp. Served with white rice to make a meal onto itself and just perfect on a cold, winter's night! 1. Heat a large pan on medium heat. 2. Add red paste packet and saute for 30 seconds 3. Add lemon grass, ginger and lime leaves packet and toss 3. Add 2 cups of water per serving and simmer for 4 minutes. 4. Optional: Strain out root vegetables from pan and discard leaving only soup broth. 5. Add red chili peppers (VERY SPICY) to taste or omit 6. Add remaining vegetables, shrimp and coconut milk 6. Set to high heat, mix and bring to a boil for 3-4 minutes. Be sure shrimp is cooked through. Serve with rice. I loved this soup, tastes just as good as the soup I order at a Thai Restaurant. I did not add any red chile peppers to my soup, but it was still too spicy for my kids. OMG! Better than what you get at a restaurant. I truly enjoyed this Thai soup. It is so refreshing and clean tasting. Next time though I will strain out the room vegetables.